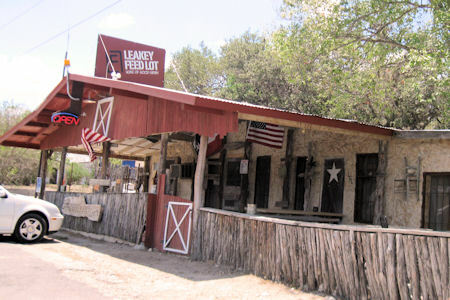 Leakey Feedlot "Home of Good Grub"
While in the Frio River Canyon on a hot summer day I decide to go to the self proclaimed "Home of Good Grub" and have some grub. 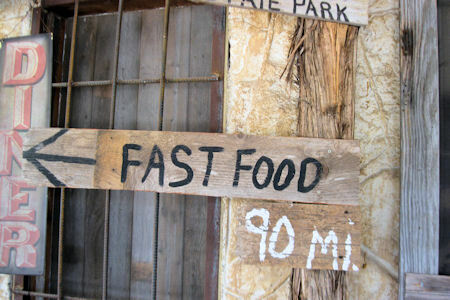 The Leakey Feedlot is an interesting place with a interesting decor. They also have their own way of preparing food. Nothing, I mean nothing is purchased pre-prepared. If you order chicken finger someone in the kitchen will cut up chicken, dip it in batter and fry it. 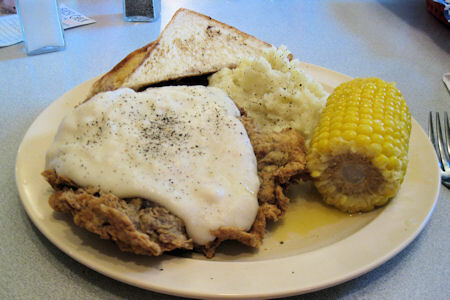 Chicken fried steaks are hand battered and fried. 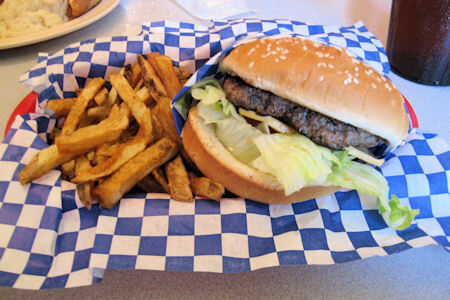 All this "just like mama would do it" preparation takes time, so it is a good idea to heed the sign by the door, "Fast food 90 miles". We ordered a hamburger basket and a chicken fried steak with cream gravy, mashed potatoes and corn on the cob. After we ordered I noticed that none of the 15 or so other diners had gotten their food yet. Then after about 10 minutes the food started coming out one plate at a time. Since we were the last ones in for lunch I could tell that we would be the last served. Several times our waitress stopped by our table, filled our drink classes and said, "It wont be much longer". During one of these visits she explained how the food was prepared. After all of this time was it worth the wait? Yes it was. Everything was very good but let me give you a specific example. The mashed potatoes were really good. They did not come out of a box. It was obvious that someone pealed, cooked and mashed these potatoes. They were just a little lumpy, just the way I like them. Chicken fried steak and sides.